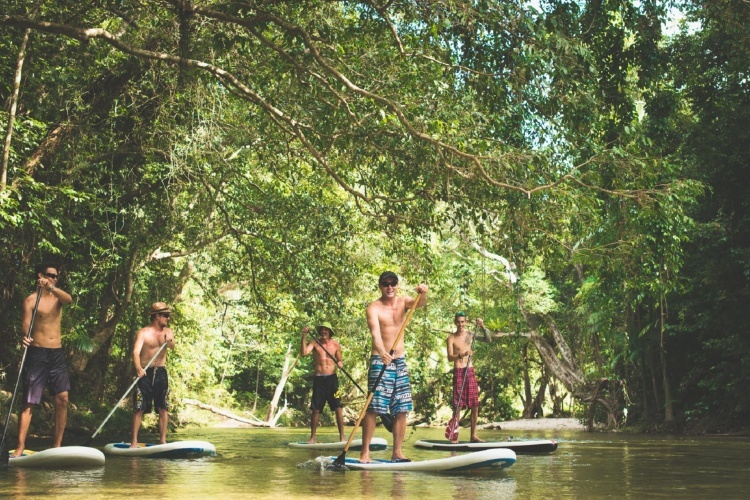 Join us on a guided stand up paddle session exploring the rainforests of the wet tropics here in Far North Queensland. Discover the magic of the oldest rainforest in the world! It is an excellent activity either for groups of friends or for the families with children! Paddle upstream on crystal clear waters under the canopy of the oldest rainforest in the world. Enjoy true peace and tranquility in an incredible pure environment. Take a dip in the cool “healing waters” or be a dare-devil and jump from rope swings in the rainforest trees. Finish this wonderful adventure with a unique natural body scrub, using ochre found on the banks of the river. Drift back downstream, feeling refreshed from your exploration and adventure. Our fully guided tour includes an experienced guide, your board hire, tropical fruit tasting and free photos of your adventure, as well as transfers from Port Douglas. If you are travelling solo, just give us a call and we’ll include you in another group session. Suitable for for all levels of experience, from complete beginners through to experienced riders, the rainforest cruise is the most beautiful, chilled out trip for SUP riders!